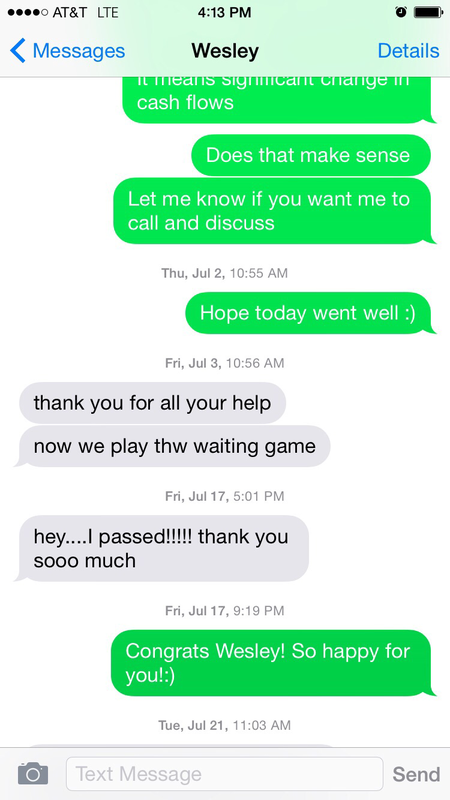 We've helped change lives. Let us help you pass! I wanted to share with you that I passed CFE and I am very excited about the next steps. I want to thank you for all your support during the preparation for the exam. I was exhausted when I came to the exam and got sick on the 2nd day, but I remembered your advice and broke everything in small pieces and took one step at a time. I still remember the video you shared with us just before the exam. Even though I apply the same principle every day in my life, it helped me focus and do not give up. I was not satisfied with my performance, but it was enough to pass. So, thank you once again for everything and wish you all the best in 2019. As you know, today was the CFE Resutts Day and I shed tears when I found my name on the resutts page! From our past discussions, this journey has been so long tor me starting from the legacy program, wri ting the CFE, SOA and UFE before transijioning to Capstone and a re-write of the CFE. I just wanted to thank you for your support tor the past few years. Through find ing you and Henry Wong (Preptormula mentor), I was ab le to fi nd the right advice to finally put a closure to th is designation. Thank you so much again! Hope to stay connected in the future! 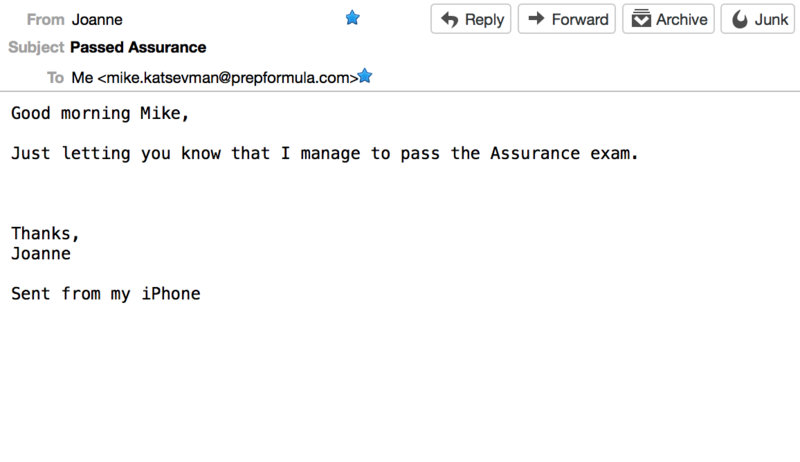 I was a student of PrepFormula for CFE 2018 and I am glad to share that I have passed the exams. I want t o sincerely Thank you and your team for all the guidance and support provided throughout this journey. The serie s of webinar and mentorship helped insti lling confidence in me to tackle cases with the right approach! 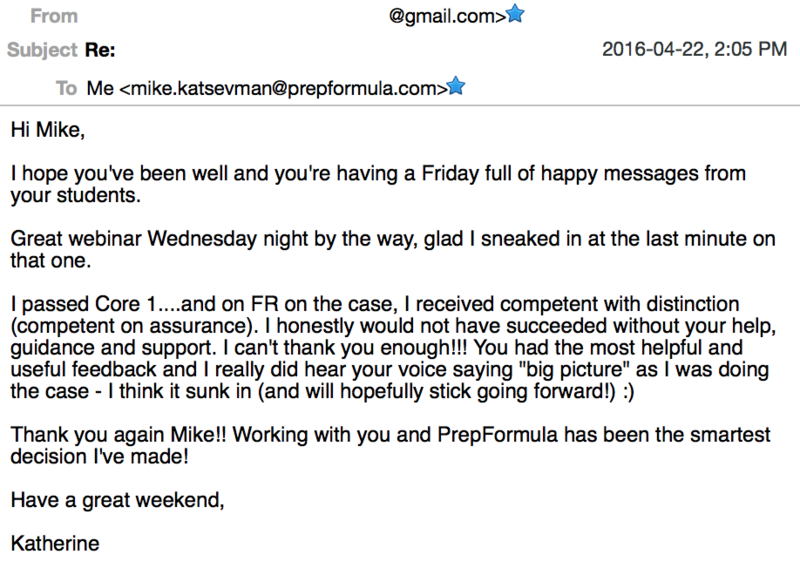 I cant express how grateful I a m to PrepFormula team for helping me achieve my dreams. I will certainly recommend and refer PrepFormula to all my acquaintances who wish to pursue CPA. I want to say thanks for the help from both of you. I have successfully passed the CFE. Thanks to you both, I passed this time around. I can't quite believe it yet...1 couldn't have done this without the two of you. From the bottom of m y heart, I am very very grateful. I have passed CFE 2018, thank for your support, it was a n amazing journey wit h Prep formula. It has provided al l that I needed to pass my Day 2 and 3. Your sessions had such an impact on my case writing skills, pl anning for t h e case and also the technical knowledge sessions were s o helpful, especially IFRS 1S, EPS and business combinations. Thank you agaian. 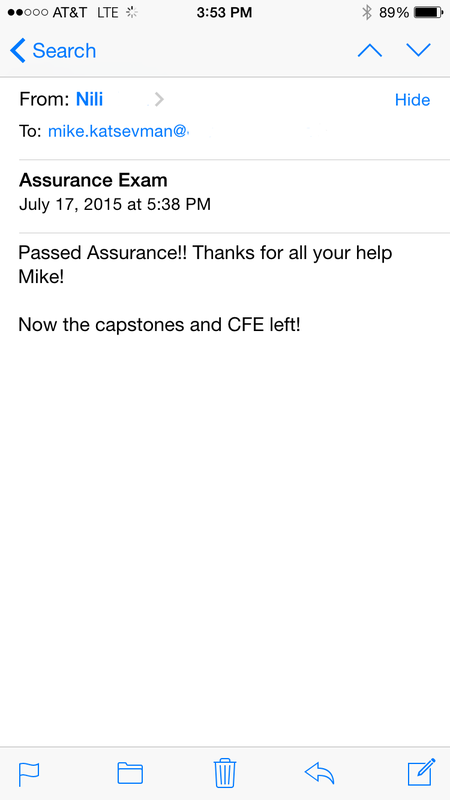 I just wanted to let you know that I passed the CFE!!! Thank you very much for all your help along the process, it really made a huge difference. I'm sure you must be drowning in a sea of emai ls, but I wanted to thank you for all the hard work you pour into your courses. I'm also happy to let you know that I officially passed the CFE. 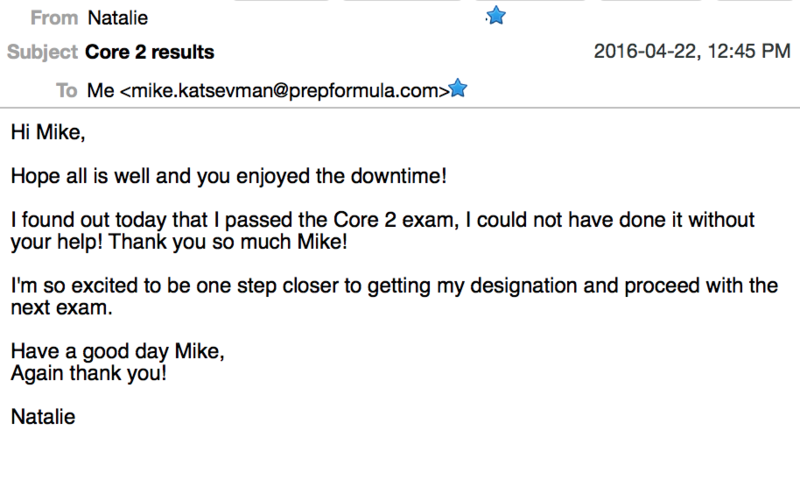 I couldn't have done this without Prepformula, you and your team's help. You've always been there for me and my endless questions. No matter the time of day. For that I will always be grateful. Thank you for the help and support! Much appreciated! 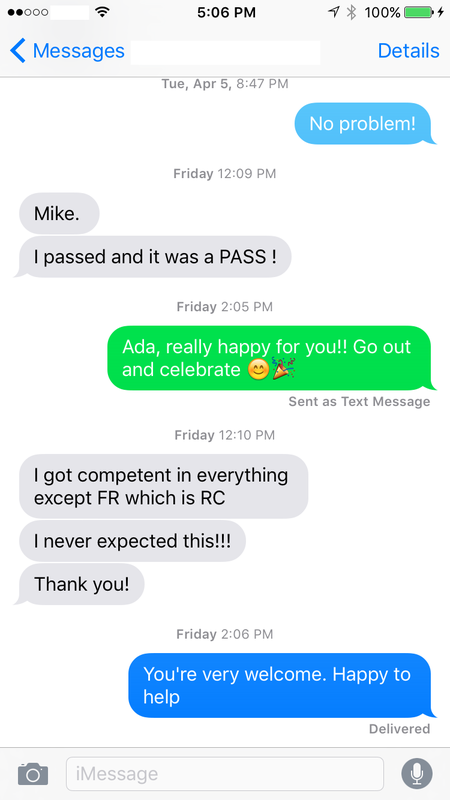 I wanted to share my good news with you that i passed CFE!!! Thank you so much for all your teaching and support. I could have never done it without that. I am soo happy that I took this course and it was really helpful. I will definitely spread the word and maybe one day would like to work with your course as a mentor@ You are a great teacher! Please keep up the good work!!! 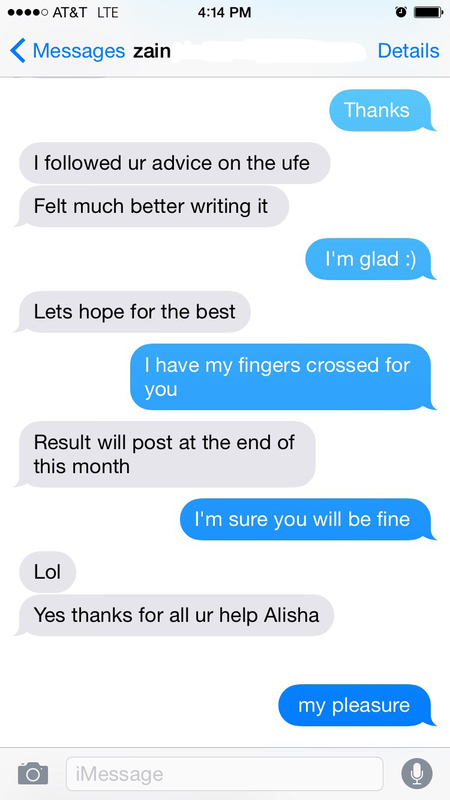 I also want to take this opportunity to provide feedback regarding my mentor Alisha Todd. She was great!!! She always was there for me and encouraged me so much to be able to achieve this goal. I had the email full of encouragement on my phone and looked at it before exam and reminded myself that people believe in m e and i can do it!!! Thank you and i hope to stay in touch! Well, this year's email is much more joyous than last year's: I PASSED!!!!!! God. I can't believe it. Haha but seriously, thank you so much for all o f your help, your encouragement, your support and your resources. I really enjoy dealing with new hires and I have helped some of the students going through PEP in a couple of different firms, recommending you is the easiest piece of advice I give them. I'm a bit sad that this means goodbye, however, it has truly been a pleasure working with you Mike. I'd love to keep in touch. 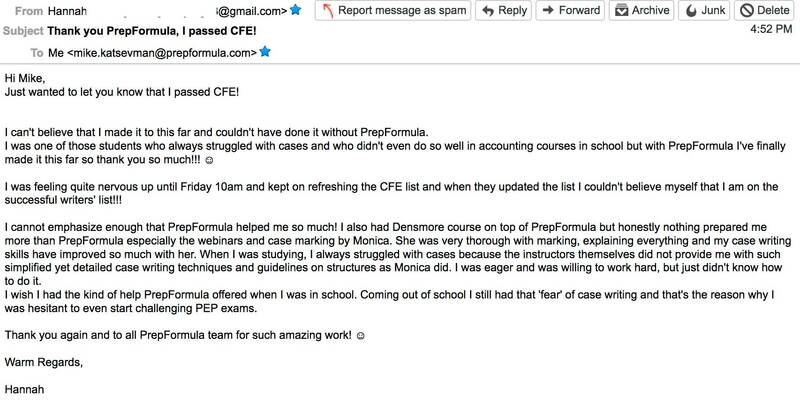 If you ever think I could help out in any capacity with PrepFormula, please let me know - I'd love to be able t o help future writers through this gruelling, emotional roller-coaster process! Dne of the things I love about public accounting are the new hires, just out of school. Thanks again Mike!! You and PrepFormula are absolute saviours. I wanted to thank you for all your help during the CFE process. I passed my exam! Although I did not use all o f the resources in your program, I feel like the video on "how to pass the CFE" was the game-breaker in my preparation. I wish I had watched the video this first time around and understood the strategy of passing the exam. Kiran - thank you for taking the time to mark my cases and jumping on the calls with me to discuss audit and tax topics. Mike - as promised, if you have time I am happy to meet up for coffee to give you feedback on the website. Just wanted to say thank you .... a very big thanks to both of you, and all of the presenters. I started studying for the 2018 CFE in Sept 2017, as I felt rusty on the technical and my case writing skills were lacking. I put my complete trust in the PrepFormula process. I found the slides and videos for technical knowledge very thorough, and I enjoyed the in-depth (and at times tough!) marking and coaching provided by Tauzer. I also enjoyed the many webinars and tips shared over the months leading up to the exam. 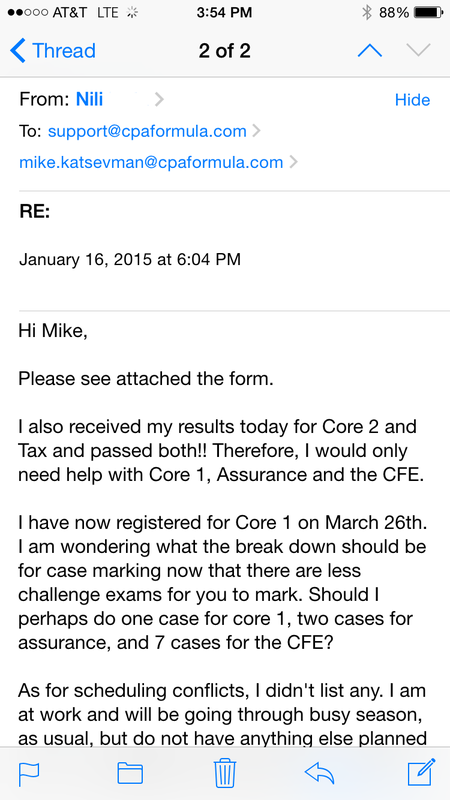 I am happy to report that I passed the CFE on my first go. 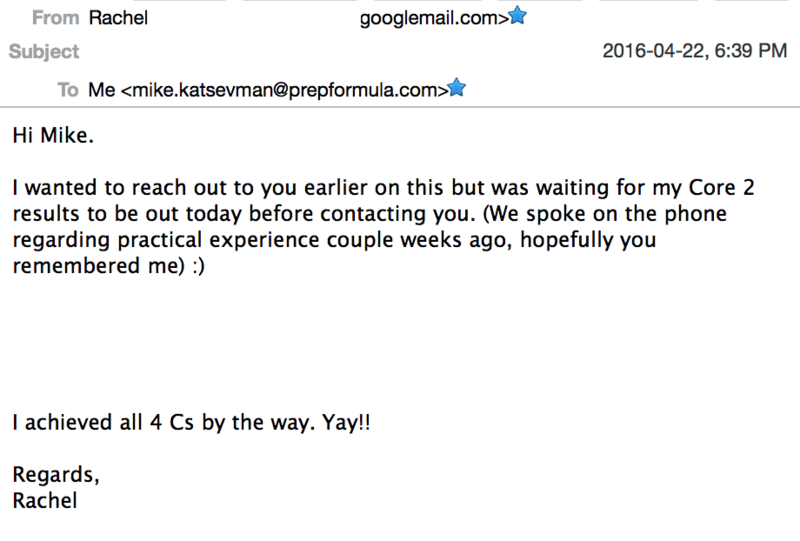 I will gladly recommend PrepFormula to anyone in the CPA program. I was enrolled in different courses for the Core & Elective exams, and d i d not feel close to the same level of support and attention from those providers (**** & PASS UFE). Thanks again, and wishing you a Merry Christmas and a Happy New Year! Thanks for all your tips and the wonderful PrepFormula program. I am so relieved and happy. 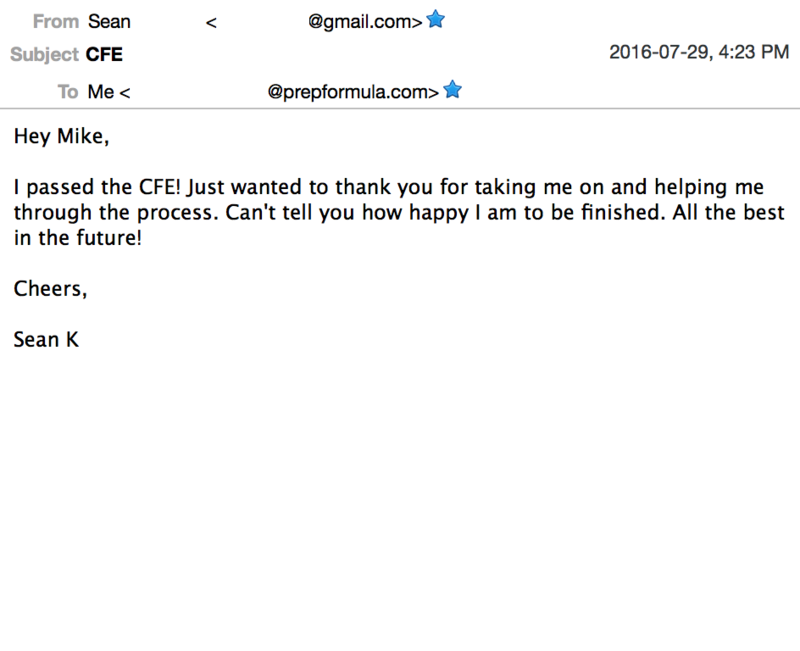 Just wanted to reach out and let you know how great it was working with Sean prior to the CFE. He not only went through the cases I had written in a detailed manner but also provided strategies to every struggle I had. 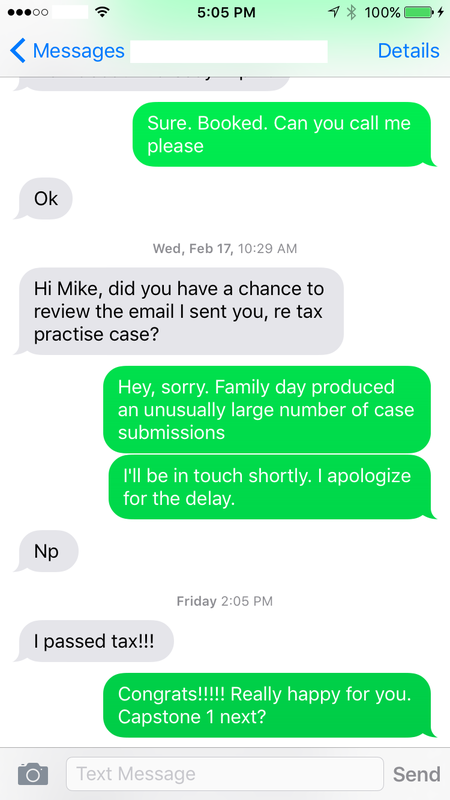 He was also able to give me pointers o n what the CPA was expecting with my analysis which helped me format my responses in a professional manner. 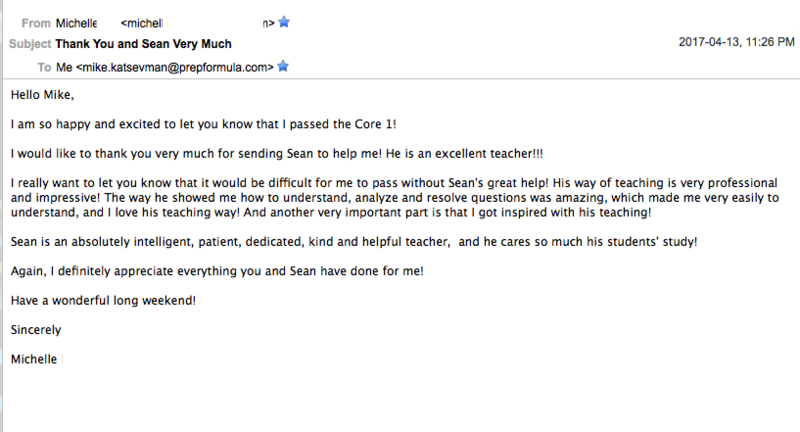 Overall, Sean was great and instrumental to myself passing the CFE. Thank you! I passed CPA. Thanks for your support during my studies. I passed the CFE! Thank you for all your help in preparing for the CFE over summer. I think your marking of my cases and our debrief chats made all the difference. Turns out I passed all days of the CFE! Thanks for all your help and guidance, I honestly don't believe I would have passed without PrepFormula. I PASSED!!! THANK YOU SO MUCH!!! Very pleased to let you know the good news that I passed the CFE. I wanted to thank you for all your help in studying for the exam this past year. I couldn't have done it without your guidance and the countless hours that you dedicate to the PrepFormula webinars. I am tremendously grateful. 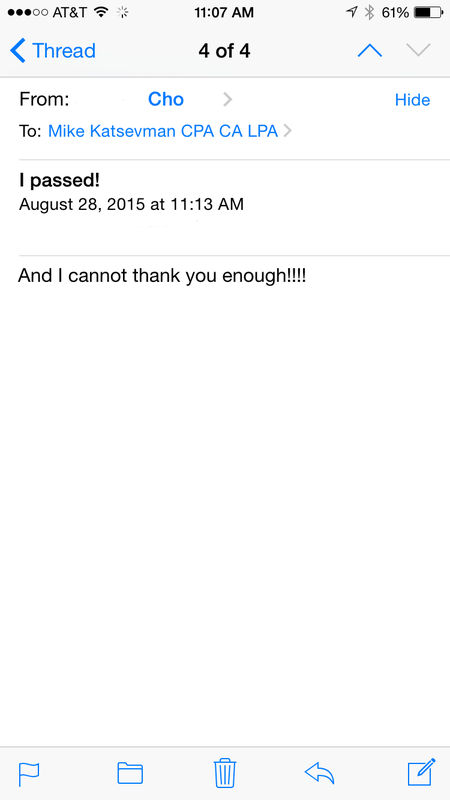 I just wanted to send a huge thank you email for all your help with studying for the CFE - I passed! 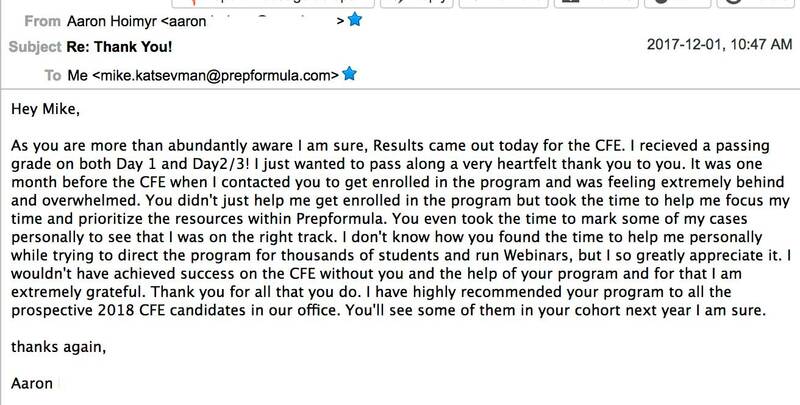 The webinars and support from Prepformula was amazing and I plan on referring everyone I know to this prep course as i truly feel i couldn't have done it without you guys. Could not be happier right now! 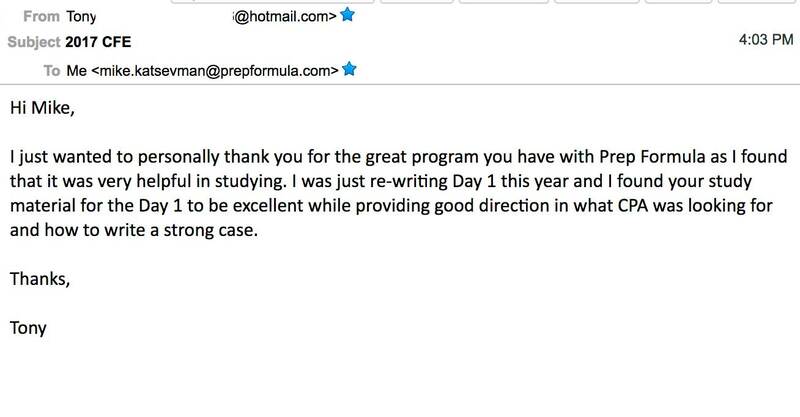 I just wanted to personally thank you for the great program you have with Prep Formula as I found that it was very helpful in studying. I was just re-writing Day 1 this year and I found your study material for the Day 1 to be excellent while providing good direction in what CPA was looking for and how to write a strong case. Just wanted to send you a quick note thanking you for all your help (now that I know I passed and it worked :) ). I found your advise to be extremely helpful when writing the CFE and you did a great job of motivating me while keeping on track! Just wanted to let you know that I passed the CFE! ! Thank you so much for your help and guidance along the way. I could not have done it without your help and encouragement! 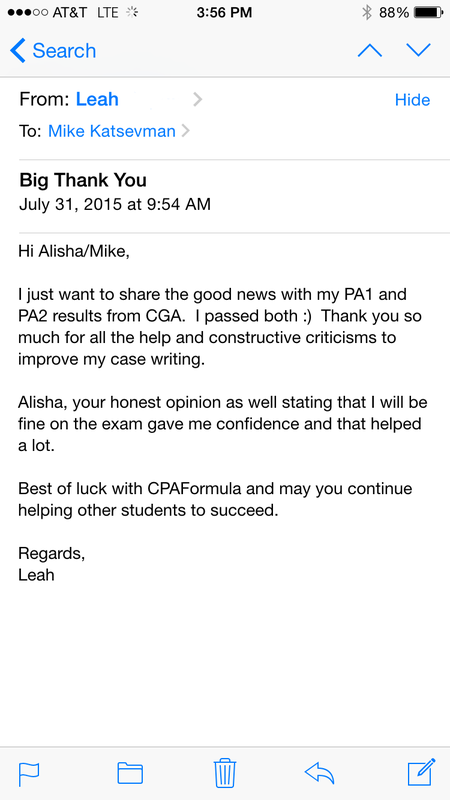 I will definitely encourage future CPA candidates to sign up for CPA prep formula to help them pass! I passed. Yes I did. Thank you for all the help you both provided me to this point. It was a difficult 3 year period but this makes it all worth it. 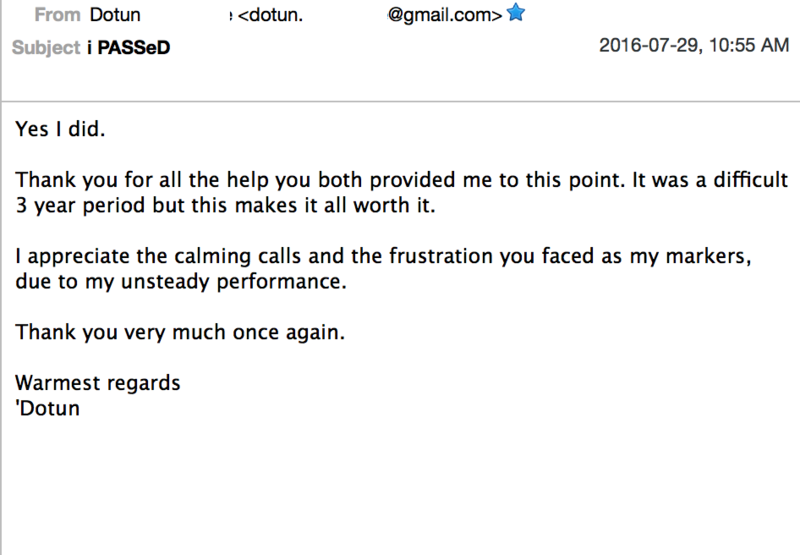 I appreciate the calming calls and the frustration you faced as my markers, due to my unsteady performance. Thank you very much once again. I passed the CFE! Just wanted to thank you for taking me on and helping me through the process. Can't tell you how happy I am to be finished. All the best in the future! Yay!!!! I have passed with the CFE today !!!!!!!!!!!!!!!!!!!!!! 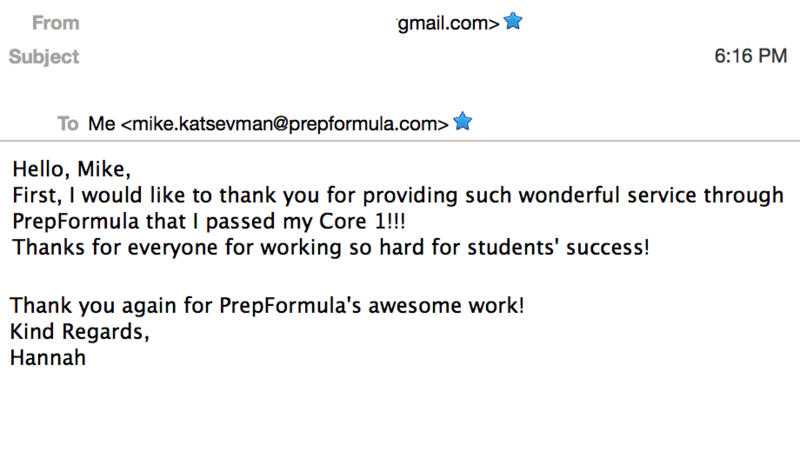 It would not have been possible without the valuable guidance and material provided by Prepformula. Tauzer Dalal is a SUPER STAR, he was always available to answer questions and his mentorship made this process a lot easier. Can't thank Tauzer and Mike enough for their continued support till the last day! THANK YOU PREPFROMULA. 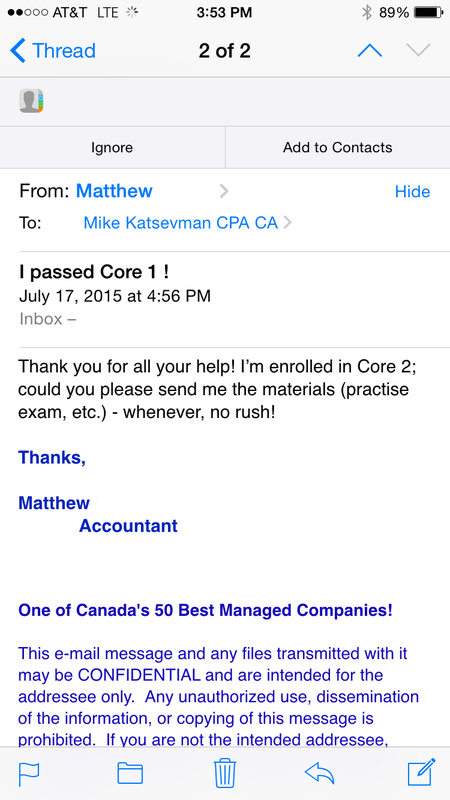 I am currently enrolled as a CPA student and I am looking to complete the CFE this year. In order to do so, I had to take the Assurance elective because they were not offering the Finance elective until summer. As someone who has never worked in audit or assurance, I have had no real exposure to the Assurance side of accounting and I wasn't sure what my chances were. I joined the PrepFormula website hoping it would increase my chances. Honestly, I was very impressed with the materials provided and the support I received. The online seminars were a huge benefit in helping me learn more about Assurance. 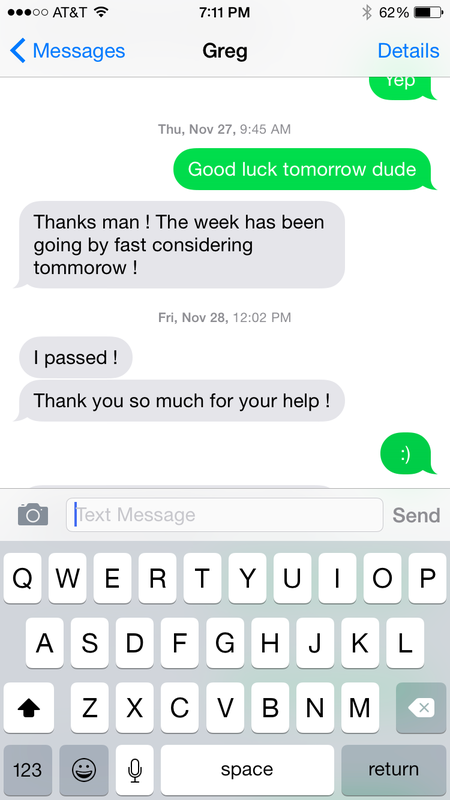 By the time the elective was over, I was confident in what I was doing and I passed the exam. 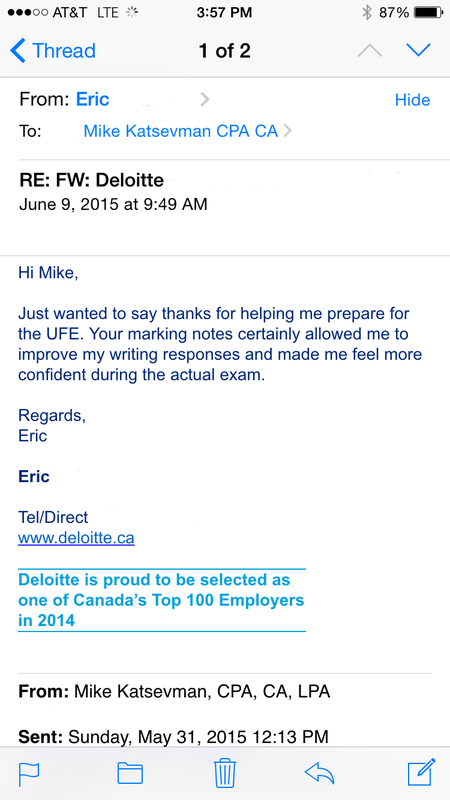 I am now looking to make Assurance my focus going into the CFE. 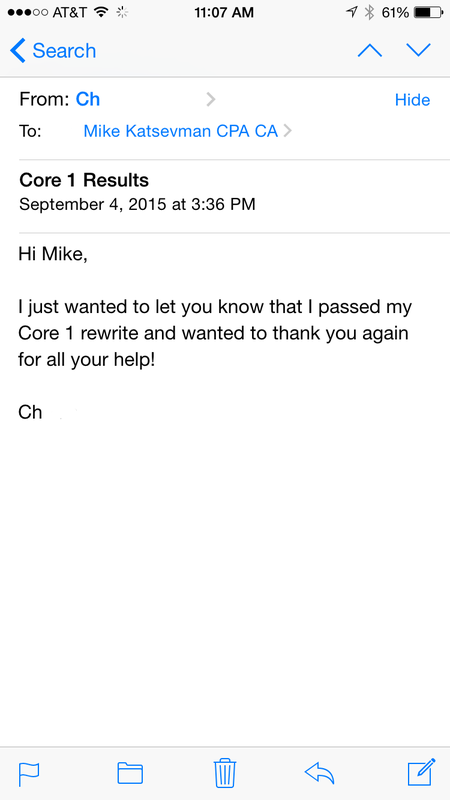 Thankfully I passed Core 1, and I want to get a move on Core 2. Thank you!! It was wonderful working wit h you and Mike. I truly believe the webinars and discussions we had on the phone were helpful. You both shared many helpful tips on how to tackle the exam without being overwhelmed. I really feel the last webinar (review session) was very helpful with helping my mindset pri or to w riting the exam. This particular exam was difficult as the case had a tax portion and it really through me off guard. 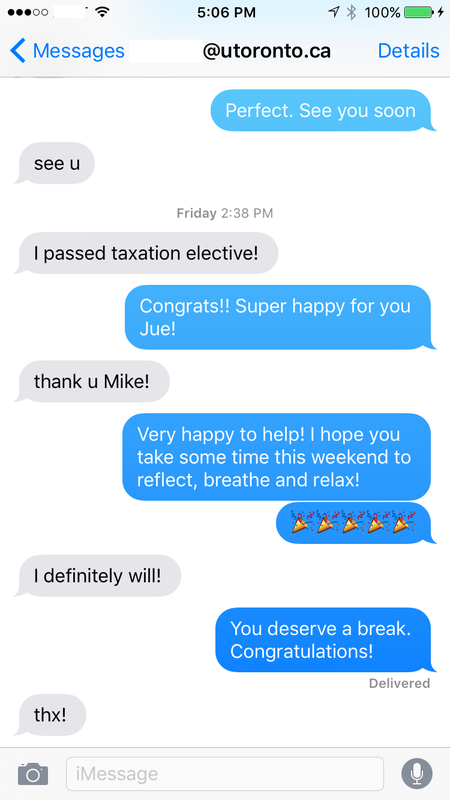 Somehow I achieved competent on the tax portion, but I completely had guessed that response. 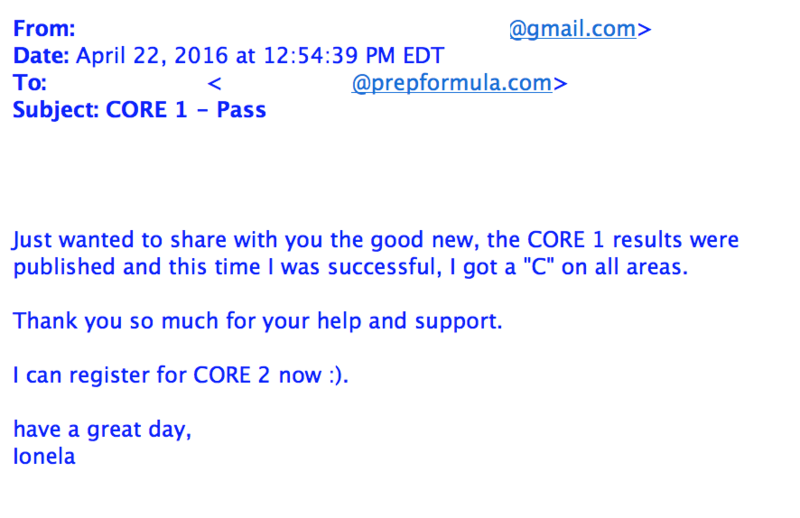 I hope you are able to assist me with core 2 as well! Thanks for all your help. I passed Core 1!! I am very happy with this outcome. Thank you and PrepFormula for your help! I am so happy and excited to let you know t hat I passed the Core 1! I would like to thank you very much for sen ding Sean to help me! He is an excellent teacher!!! 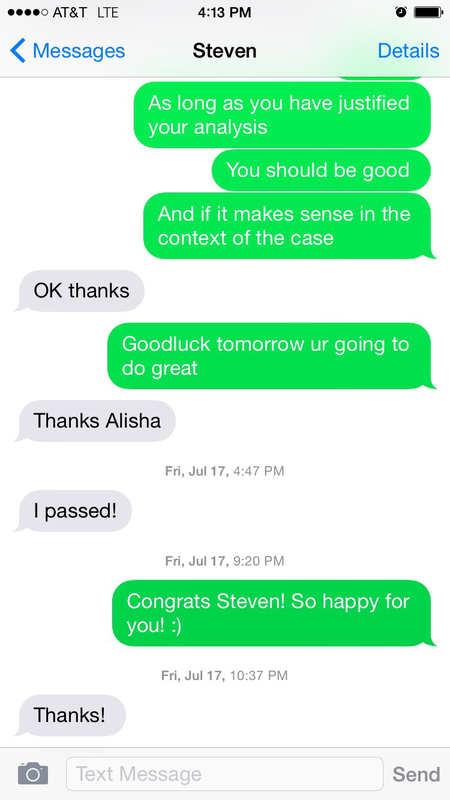 I really want to let you know that it would be difficult for me to pass without Sean's great help ! His way of teaching is very professional and impressive! The way he showed me how to understand, analyze and resolve questio ns was amazing, which made me very easily to understand, and I love his teaching way! And another very important part is that I got inspired with his teaching! Sean is an absolutely intelligent, patient, dedicated, kind and helpful teacher, and he cares so much his students' study! Again, I definitely appreciate everything you and Sean have done for me! Thank you so much for your thoughtful phone call and encouraging message before the exam... thankfully and also thanks to you, I passed core 1 with distinction! I am so happy with my result... Thank you so much again and I hope you have a great weekend! Thanks very much Shawn.. It is a great feeling. I'm on to Capstone 1, 2 then Final. Thank you for asking and your help. I passed the exam!!!!! Yeah!!!!!! Really appreciate the suggestions that you have been shared with me, which is very helpful. I think I still need your help when I start my CORE 2. Please keep in touch. Thank you for the webinar today, I really enjoyed it and thought it was a great learning tool. I checked both of the links and I have access to both videos now so thank you for that. It is really going to help with my upcoming Core 1 exam in 4 weeks. 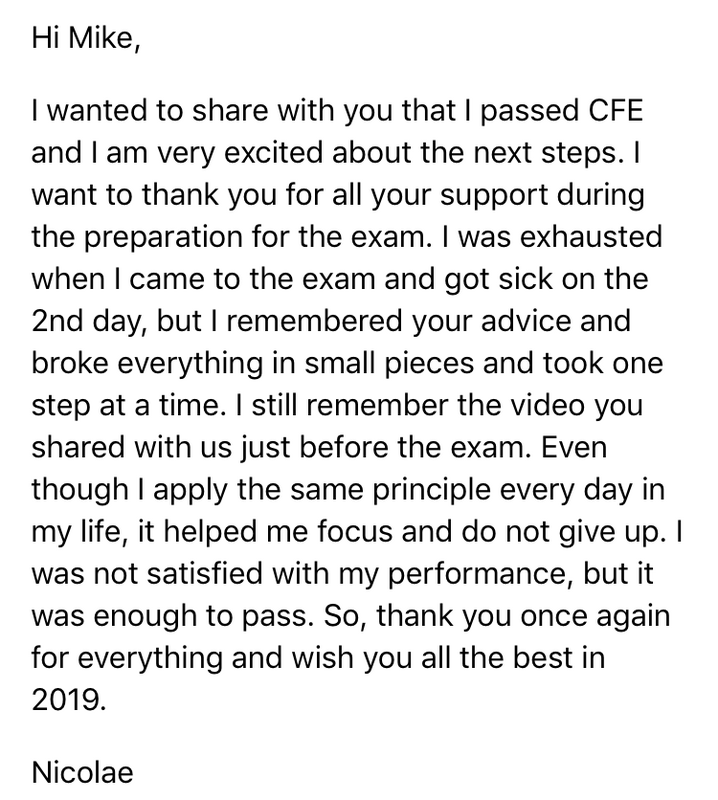 I want to take this opportunity to thank you for the tremendous support that you provided in order to make me ready to write the CFE in September 2016. 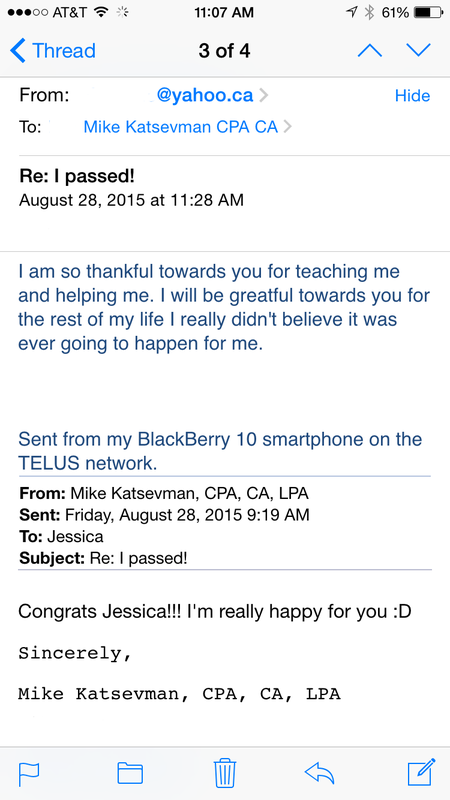 Coming from CGA to CPA was not an easy task for me . It seemed that I have to learn everything all over again. I participated in almost all the webinars that Prep formula held during the year, and I learned the techniques how to approach the exam. Just wanted to let you know that I passed the taxation exam, thank you for all your help! 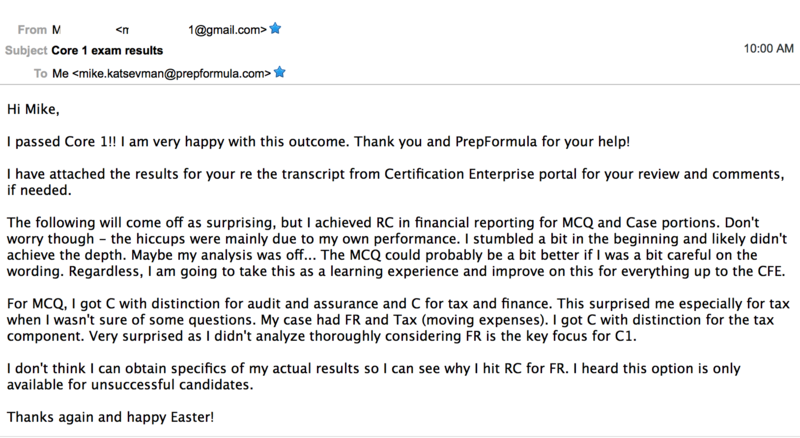 I had a review appraisal with my partner and he was impressed on how well am I doing in the CPA program and I told him he should thank PrepFormula (you) for making me a stronger case writer. Just letting you know that I manage to pass the Assurance exam. 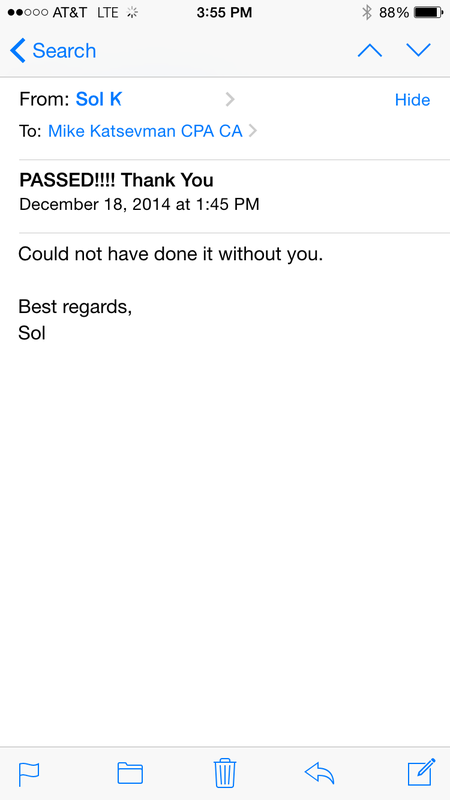 I just wanted to let you know that I passed my assurance exam and to thank you for your help again! It really does make a huge difference to me!